First, on behalf of my kababayan I wish to thank you – my dear readers, followers and the world – for the kindness and outpouring of support and generous help you have extended to the typhoon Haiyan-affected areas in the Philippines. I am also grateful that families of my nieces and nephews are all accounted for and have left the devastated area. Thank you so much for your thoughts and prayers. 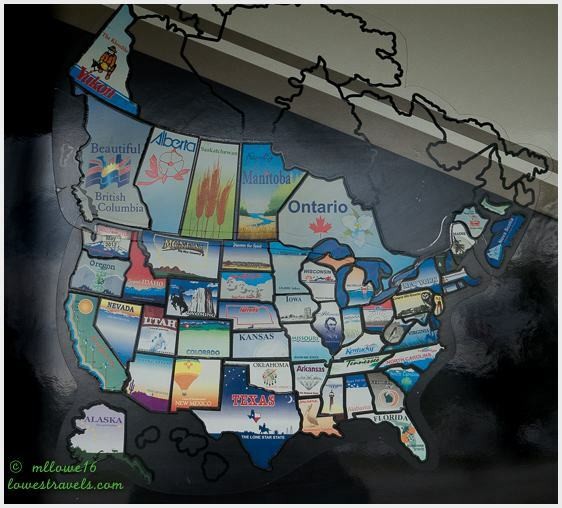 As for us, we nomads are continuing to inch our way southward – with our next stop being Charleston, South Carolina. As first-timers in the city, we made our usual initial stop at the visitor center. 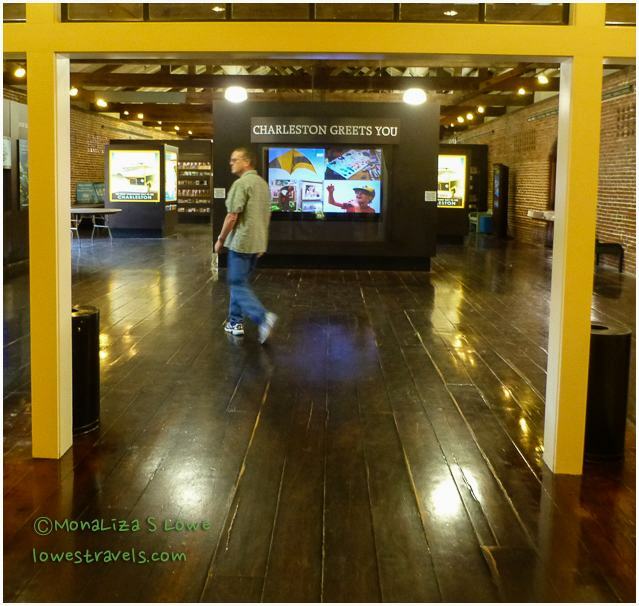 The center itself resides within a restored 1856 railroad freight depot. 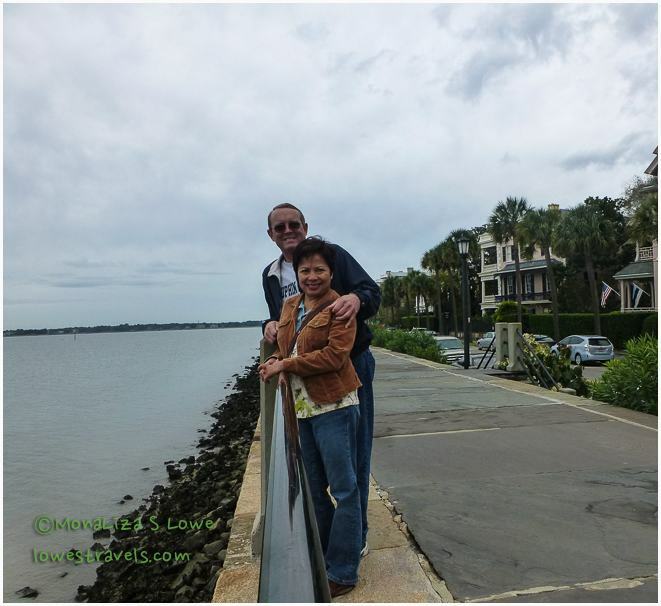 We were given several choices of ways to explore the city, and we chose the Historic City Tour with the Fort Sumpter ferry cruise. We thought it would be a good way to learn about the historic city via land and sea. She also pointed out the piazzas. 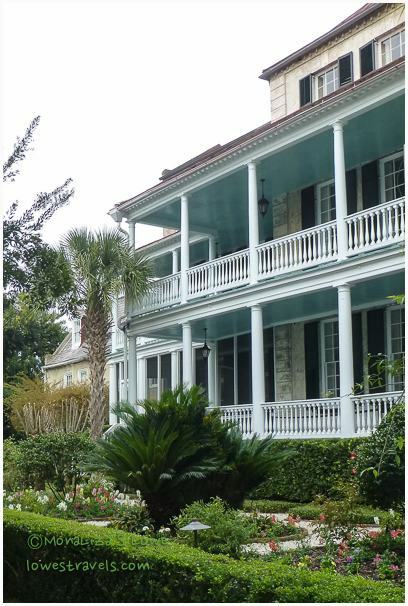 Unlike the piazzas of Italy, which are open city squares, the piazzas of Charleston are the tiered, covered porches (or verandas) that grace so many of the lovely homes throughout the historic district. After suffering extensive damage during the 7.2 earthquake in 1886, many homes and buildings had been reinforced with earthquake rods. The rods were inserted into and through the walls, then anchored on the outside of the structure with iron bolts and plates. The basic plates are usually disc shaped; however, many home and building owners spruced up the plain appearance of the exterior plates with decorative cast iron pieces in various shapes. Charleston is nicknamed “The Holy City” because of its more than 100 houses of worship and a skyline specked with steeples. Several preserved homes are well marked while some have historic plaques. 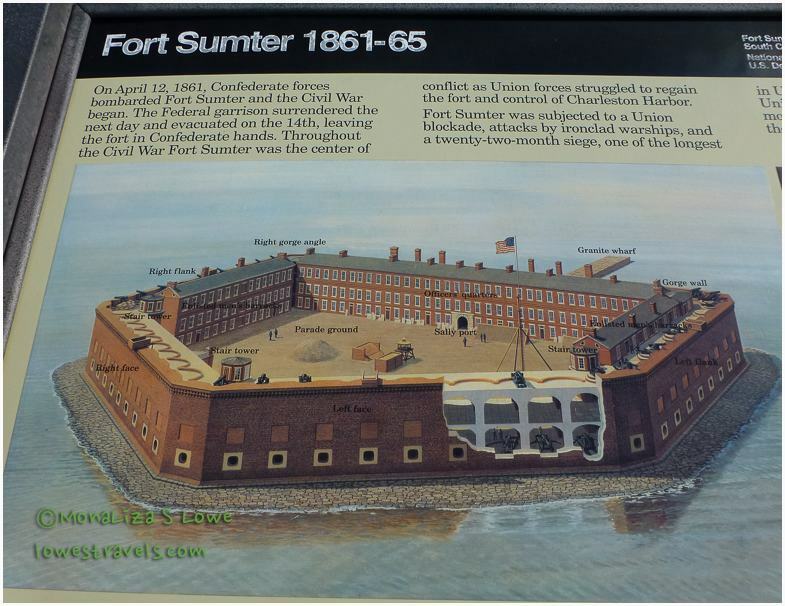 We continued on to our 30-minute ferry ride to Fort Sumter, a National Monument. 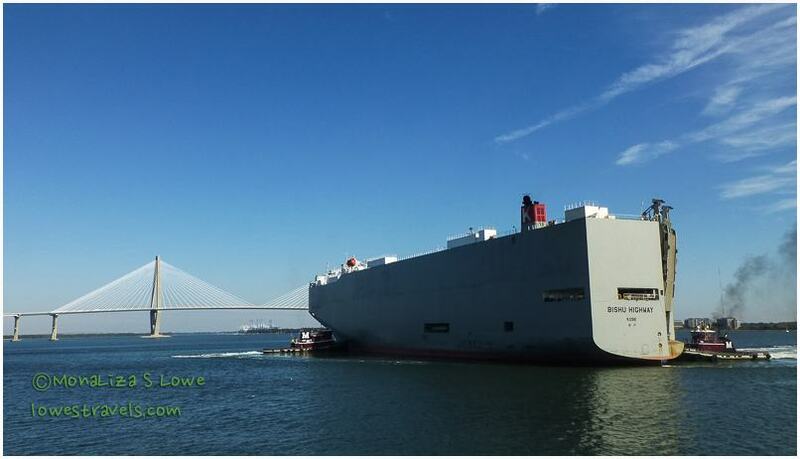 As we departed, we were entertained by the maneuvering of a massive cargo ship coming into port to be loaded with BMW’s manufactured in Spartanburg, SC and shipping to Germany. Funny how the world works nowadays! A lot of BMWs will fit in that thing! Last summer in Montgomery, Alabama, one of the plaques we read about the Civil War indicated that the first shot signaling the beginning of the war was fired at Fort Sumter in 1860. Well, despite having been to many forts, here we are visiting yet another one. And after listening to a brief history talk by the ranger, we explored what is left of it. 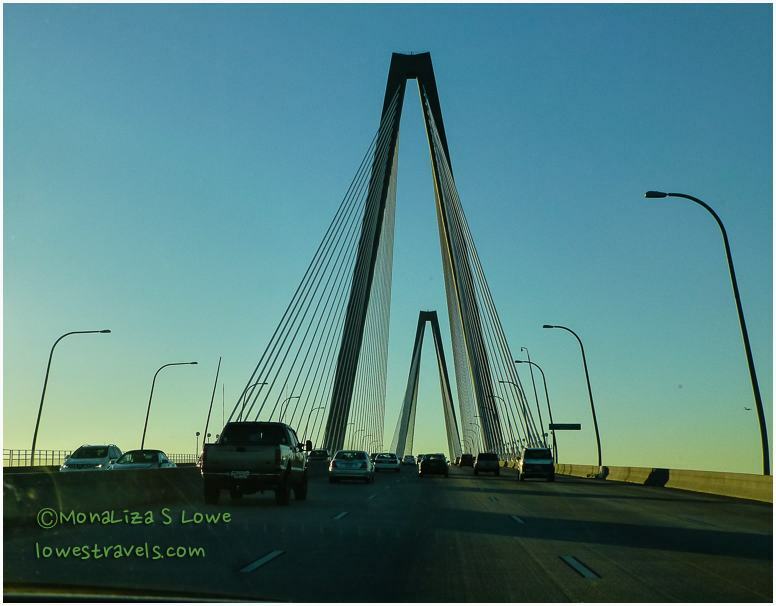 Since there are so many sights to see in Charleston, we tried to do as much as possible during our limited stay. After the guided tour we explored the city and surrounding areas on our own several times. 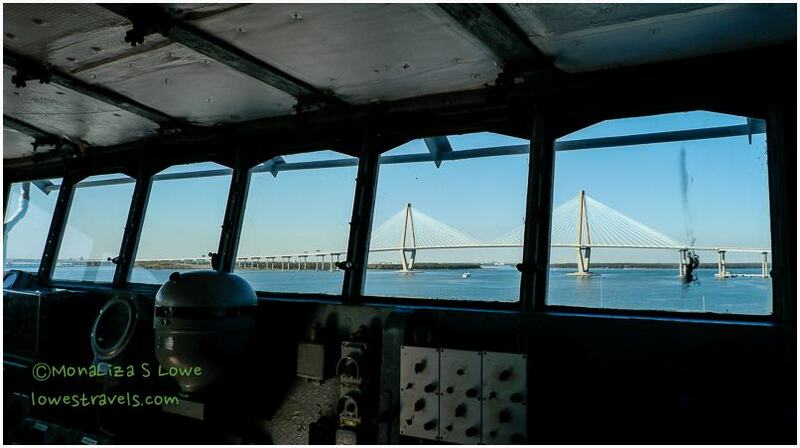 We crossed the Arthur Ravenel Jr. Bridge – hailed as one of the longest cable stayed bridges in North America – to visit Patriot’s Point, home of the USS Yorktown. 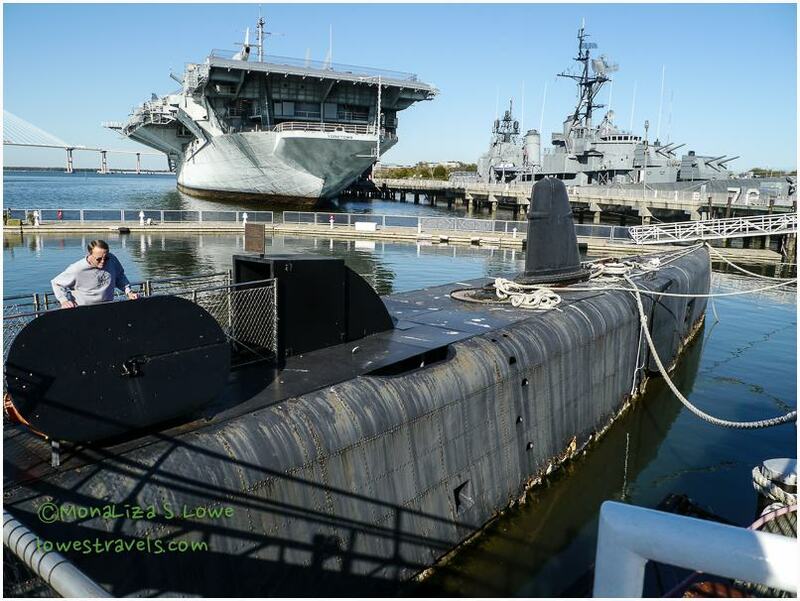 We toured the Yorktown, an aircraft carrier turned naval museum. 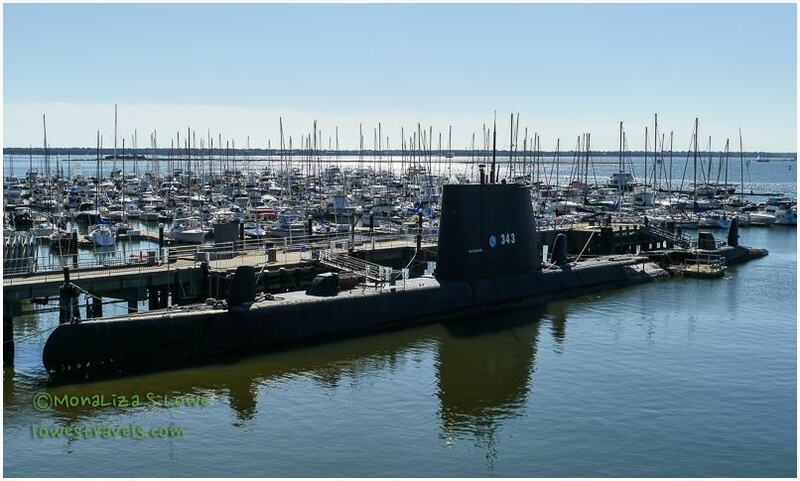 Also docked here and available for self-guided tour is the USS CLAMAGORE, a 322-foot diesel powered submarine. Our morning was spent touring both, gawking at displays and exhibits that told the stories of men, women and families who sacrificed to preserve our freedom. This was our first time on an aircraft carrier, and we were amazed at its enormity as we followed six self-guided tours. It is definitely worth a look If you are into naval history. Despite the chilly wind that day, we checked out but did not stay long at Sullivan’s Island’s Beach to view its lighthouse. Then it was back to “headquarters”, the Oak Plantation Campground where we stayed during this stop (Steve’s review is here). While we were checking out a historic home, a car pulled up and the driver asked Steve if he was from Alabama, because of the shirt he was wearing. It turned out the guy was a real estate agent, but also a very friendly person. 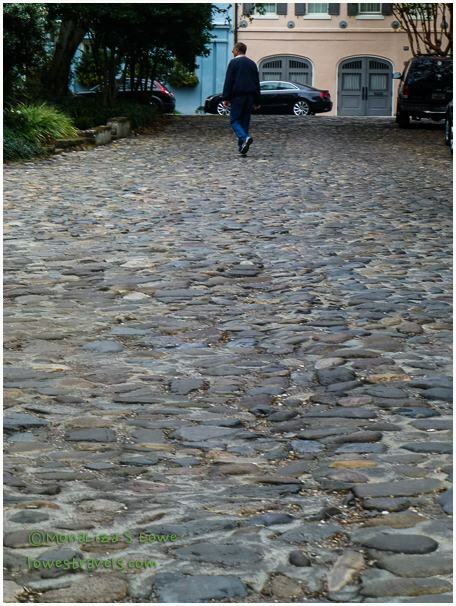 He told us briefly about the history of the cobblestones that we were strolling on. According to him these stones were used as ballast on ships that came into port clear back in 1670. Before loading the ships with cotton they had to get rid of the stones, so the city made good use of them on the streets. Unfortunately, we did not have an extra $3-7 million dollars in our pockets to buy one of the homes he was selling. Wandering around the city gave us a taste of what it was like in its heyday, when it was considered the wealthiest city during colonial times. Although Charleston is a large city, we thought its vast inventory of historically significant architecture made it an interesting and charming place to visit. Wonderful picture tour Mona Liza. Charleston is a beautiful place. I love the row of trees in the extra photos. I’m happy to hear your family is okay. You sure are having a wonderful trip! I had a pic of me standing and I actually blended in with the trees. We are having a great time here. Glad you had a great visit in Charleston. You had quite a comprehensive tour of the city, even a little private lesson on the road. How cool:) Beautiful photos! 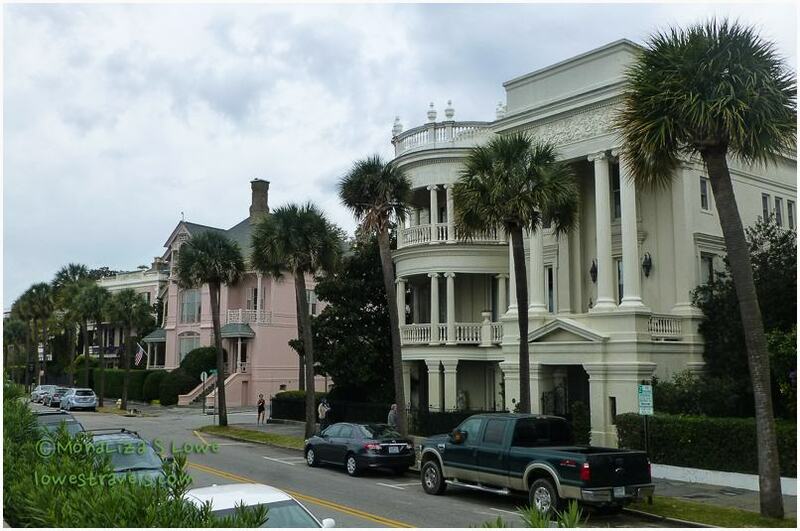 Isn’t Charleston a beautiful place? I enjoyed your history lesson. It was good to see Sullivan’s Island too. We didn’t get there. It is the setting of Dorothea Benton Frank’s novels. Is it nice? Your photos are fantastic as always. It is and we even missed the Magnolia Plantation. That would have more great pics. Hmm I don’t think I am familiar with Dorothea Benton Frank. What kind of stories are on her novels? Romantic slush but I like her writing style and of course her settings. So glad that your family is now safe and sound. Loved your photos and write-up of this area. My husband has been there on business travels and wants us to go there sometime. 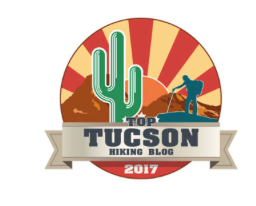 Thanks for the nice write-up! I think you should schedule some days to spend here. There is so much to do. I think you would really spend time here just looking at these houses. Unfortunately we don’t have 3.5 handy that day or we would have bought one of those historic homes. And yes, i take your Colorado ranch in a second. Wonderful post MonaLiza! Having just traced your footsteps I have to say that your photos and writing really capture the city. Safe travels. Thanks Sue, but we missed the Magnolia Plantation 😦 Darn that cold snap i could have hanged out with you. Thank you, we still are kicking ourselves for not seeing Lewes. If you have noticed I don’t have a post of our stay in DE. Maybe one day when you decide to travel again we could meet up somewhere.